Major Richard Smith of KCPD East Patrol (far right in photo) participated as a mentor at Pictures of Hope. He shares his experience here. Walking into Sheffield Place, my mind was wondering what the day would hold. This was my first experience with “mentoring” and I have no artistic ability whatsoever, and wondered if the young person assigned would quickly figure out both in no time. 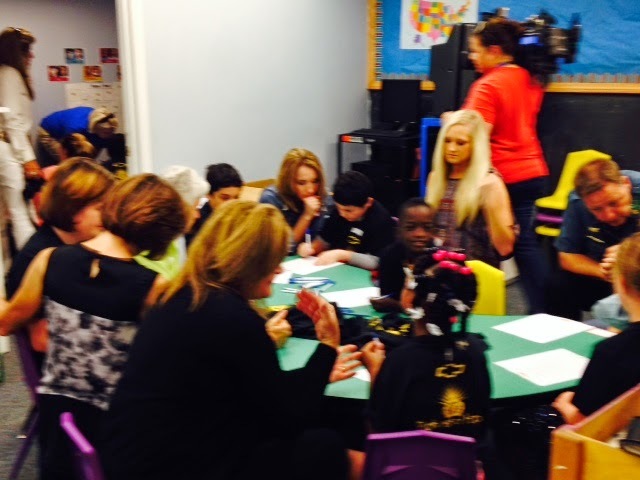 I was lucky enough to meet several other mentors prior to meeting with the kids. It was a great atmosphere, as everyone looked happy and ready to tackle the day. A quick meeting with Linda Solomon helped to give us mentors a picture of the goal, helping kids articulate their hopes and dreams through a camera. Linda read some inspirational cards that had been derived from this project, man the pressure was on now. Marty Dahmer made a nice presentation, he let us all know that Chevrolet and Cable Dahmer Chevrolet was sponsoring the event with sincerity and conviction, traits that are rare in many charity events. The children were all given T-Shirts, only one kid said he would not put the shirt on. Soon the mentors were called and the directed to the child they were going to mentor. I approached Ken [not his real name] wondering if he was going to allow me to talk to him. His head was down, he was the kid who would not put on the T- shirt and said to someone that he didn’t want to, and he seemed less than enthusiastic to have a cop in uniform next to him for the next couple of hours. I talked with Ken and we worked through his hopes and dreams. I quickly realized he was much like me and stuck to typical boys’ hopes and dreams. After some “getting to know each other time” I asked Ken if he would put on his T-shirt. Since he has a particular hairstyle I demonstrated on how to roll the shirt up to the opening so he could just stick his head through without messing up his hair. Trust was built! Our picture experience was as expected. Ken learned how to use the camera as a video recorder and soon he was without any power in the camera. Since the camera was dead our time at the park was spent playing rather than photographing. Ken didn’t seem to mind. Upon our return to Sheffield, I introduced Ken to a bullet proof vest and a gas mask. I had no idea that anyone could be so cool by possessing these items. Ken’s first words were, can you take my picture. This was particularly important because Ken’s number one hope or dream was to be SWAT guy. For Ken the best picture of hope was not across town but right in front of Sheffield, where Ken was the proudest Tactical Officer I had ever seen. It was an awesome moment. Becky [not her real name], Ken’s mom told me that he had recently been to a surplus store and Ken had wanted a gas mask that was displayed on a manikin. Wow, sometimes cops are at the right place at the right time! Ken and I ate lunch together and I promised him that he could use the mask for Halloween if he would like. Ken said that would be great. Ken taught me on how to be a mentor and we accomplished the goal. We both had a rewarding experience, one that will last lifetime. Thank you for an amazing experience with Pictures of Hope. My 18-year-old niece Jessica and I were mentors to Ben, who hopes to be a bug doctor. I told him the word for that is really big: entomologist. He said he wants to help bugs. So with Jeannette driving, we went to the Discovery Center on Troost near the Kauffman Foundation and Stowers Research Institute. Ben was in bug heaven. 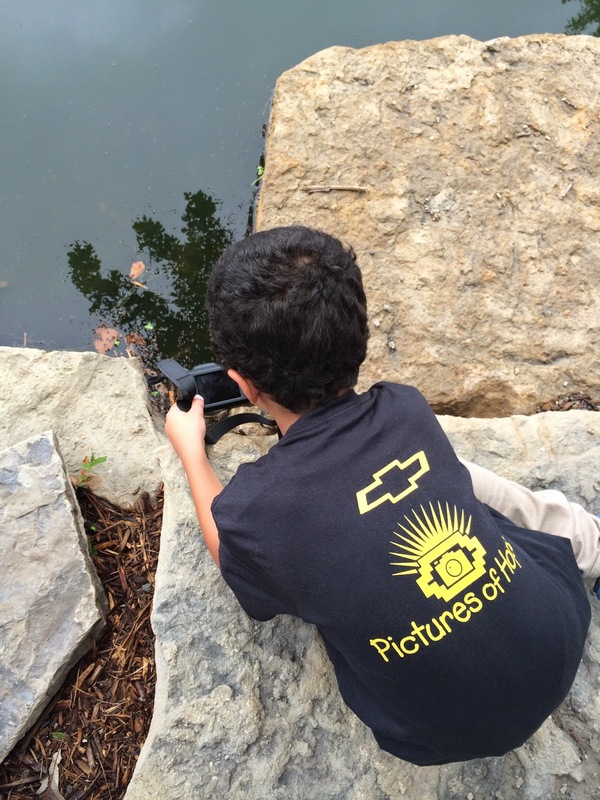 He was thrilled with his camera, and while only 6 years old, he figured it out really fast. He captured pictures of roly-polys and butterflies, bees and a baby bunny. The Discovery Center walking trail leads to a pond where he saw “cute little water bugs” that were captured quickly by the camera lens. Inside he took pictures of turtles and snakes, and even a tarantula. We met several conservation department teachers and workers who told him about their jobs. Jessica, Jeannette and I were truly inspired by Ben’s passion for bugs, and life! 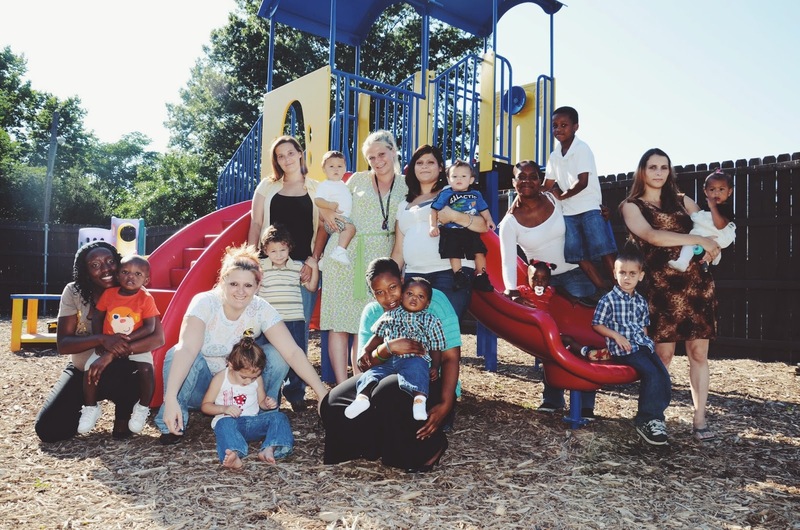 If any part of you is skeptical that a program can help homeless mothers turn their lives around, then you really need to check out Sheffield Place. A few of my girlfriends and I had our husbands and children go with us to fund and cook a Saturday evening meal for the residents at Sheffield Place. Nothing big - just burgers, hotdogs and a couple of sides for about 10 women and 20 kids. This turned out to be the best charitable event we have experienced. It was good to see that the Sheffield Place demands a lot from these women - no alcohol, no drugs, no staying out late. The mothers must care for and prepare meals for their children. Both the women and children attend daily in-house programs designed to improve their scholastic, developmental, behavioral, and social skills. Sheffield Place is really a place of hope. Even my junior high school children realized that this was not just a government-hand-out-program for the poor. Sheffield Place is a place for healing and improvement. These women are very fortunate to get to live at Sheffield Place with their children, and we could sense they didn’t take it for granted. That is so refreshing.